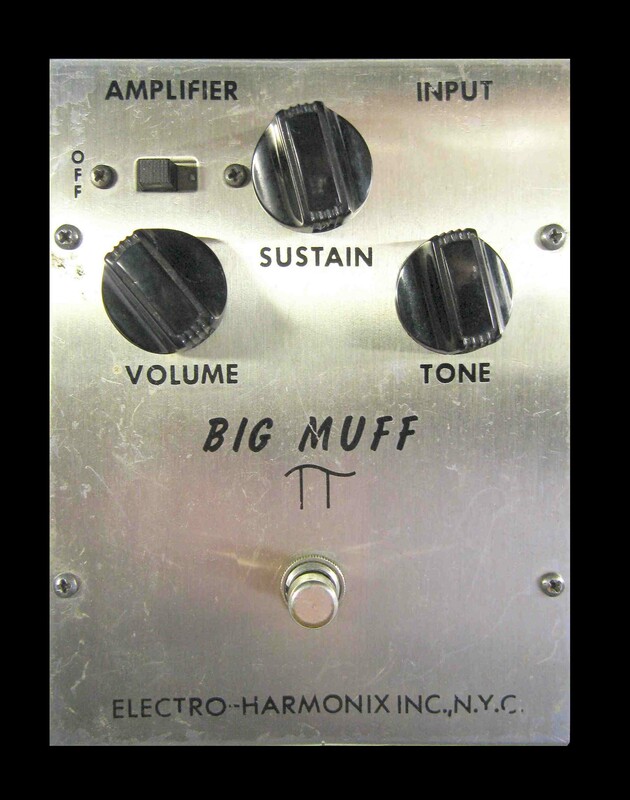 The Electro Harmonix Big Muff Pi was engineered by effects pedal legend Mike Matthews in 1969, before being released out to the public in 1970. The sound created by the pedal (and name!) echoed the musical era, prompting huge, sustaining guitars to take the main stage and surf the wave of Stadium rock that was about to happen. Whether used by greats such as Gilmour, Santana and Hendrix or modern players like Jack White, the Big Muff Pi is in a class of its own when it comes to creating guitar tones on the brink of sonic mayhem. – Volume: This controls the amount of output the pedal produces. When used anywhere past the 2 o’ Clock mark, a large volume boost becomes apparent. I swear by using the volume control as a primary source of achieving a good tone with this effect. Pushing up the volume allows the tone to breath more and avoid sounding overly fizzy. – Tone: All the way to the left, a scooped bassy tone is evident; the opposite end opens up a brighter tone with a huge ability to cut through the mix. This ability to quickly tone shift will have you sounding like Black Sabbath one moment and the Smashing Pumpkins the next. – Sustain: This is where the money’s at. The sustain control determines exactly how much fuzz/gain is added to your guitar signal, sending it from a slight grumble of crunch up to an ecstasy of creamy, fuzzy goodness. All this is housed in an oversized metal enclosure with classic old-school graphics emblazoned on the face. A bright red LED indicates to the user whether the effect is in use (although you’d have to be daft to not hear it!) The input, output & power supply are found on the top on the enclosure allowing other pedals to be crammed closer together side-by-side so that pedal board space is used effectively. The only niggle I have with the pedal is the fact that a centre-positive PSU is required to power the effect rather than a typical centre-negative Boss style adapter but so long as you unplug the input jack when not in use, the battery life is typically long lasting. Overall, the Electro Harmonix Big Muff Pi is a pedal that has provided a sound for a generation, and will continue to live on in the ears of tone seekers as one of the effects that started a revolution. What’s the difference between the Focusrite Scarlett and Clarett interfaces?